This is the place to be if you're looking to build your very own aquarium inside an Apple Macintosh Classic computer. This page has all the links you'll need. Or click here to get to the detailed building instructions complete with photos. Currently I have three fish in my tank which resides at home: one albino pristella tetra, one golden cloud minnow and one white cloud minnow. The tetra is pretty much the boss of the tank. He is a peaceful ruler, but he chases the other guys around every once in a while to let them know who's boss. However, the other dudes aren't scared of him. They will chase him back. It's a good, active tanklife. Often times, the tetra will look out the tank and stare at me. He's probably thinking, "I can take on that punk. He's all mine." I have a reproduction of a Pablo Picasso lino cut print in the background of the tank. I also have a laser print repro of an Apple poster with an image of Picasso and the "Think Different" tag from Apple's famous promo a few years back. And there's whack-smack flower deco in the center of the tank. Because of the angle of the photo you can't see the gravel, but I went with a mix of red and dark red gravel to match the flower and the red Picasso print. 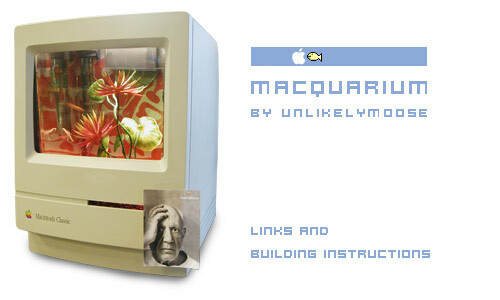 Below you'll find some links to make your very own mac aquarium. Alot of the links are people like you and me sharing their adventures. www.lib.uiowa.edu/ no instructions, but nice photos of them building their macquarium. awesome custom tank. 0 www.macquarium.com First of all going here will give you jack squat in terms of transforming your Mac into an aquarium. It's the site for some technology communication firm. -- www.lowendmac.com/.shtml an excellent source for links to other macquarium sites as well. You can always go to my favorite search site, http://www.google.com and look up macquariums there too! -- iwbyte.com/matt/macquarium short bit of info from fella on his experience on building a macquarium. One of the few links mentioned by Yahoo! homepage.mac.com/patrickng/ Hey! This guy links to my page! That's great. I hope more people do! He's got some nice mood photos of his macquariums. -- microserve.net/hac/interesting/ people say these guys are the original macquarium creators. The links is available under permission only however. -- store.yahoo.com/redlightrunner/ if you don't feel like building one, you can buy one here. 1/2005: looks like they don't sell mac aquariums any more. -- www.frill.com/~strcrazy/macaqua.html don't know why i link this one. It's short and brief. very short and brief. 8 lightning.prohosting.com Lots of details on how to construct a macquarium. If you want to build the tank yourself, they have nice diagrams and dimensions! 9 www.unlikelymoose.com/more.html why it's my own site. Hey, I do have a pretty impressive list of links here. -- macupdate.com pretty cool! they have free macquarium desktop icons! -- vividpicture.com/aleks/macquarium/ here's a woman modeling her macquarium. site has instructions. They built the tank themselves. The silicone looks pretty bad. -- billyrhythm.com some dude who thinks he is going to "corner the market" of macquariums cuz he got a bunch of old Apple computers dirt cheap. More power to ya buddy. -- wreck.org/pictures/Winter_00_3/14.html As I am compiling my list of links, I am starting to find the site that show one photo and have a brief description to be quite charming. This one fits in that category. The photo is even out of focus! classic. 9 web.mit.edu/mouser/www/macquarium WOW! This guy is making a BULLET-PROOF macquarium. How cool is that. No way is any sucka gonna gun down his fish. They are well protected. Hand it to those folks at MIT. -- www.type2guy.com one page. one photo. -- techtv.com/callforhelp I miss the old days the Screen Savers with Leo Laporte, Megan Morrone, and Patrick Norton. This link is dead. I'm sad. -- br.fgov.be Wha? Huh? They guys seem to think there is a species called, "Lepidoderma macquarium"
-- techtv.com/callforhelp not much info. and their links are dead. dated info as well. -- utdallas.edu/~jazzman/ hmmm... how about a strobemac? Apple, and all references to Apple stuff are trademarks of Apple Computer, Inc. All other brands, product names, logos, images, multimedia elements, and technologies are trademarks or registered trademarks of their respective holders, and are hereby acknowledged.